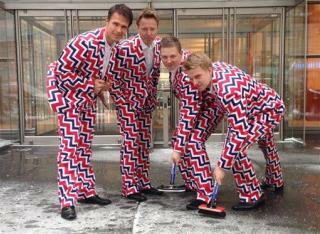 (Newser) – This may be the best (or at least second-best) Olympic photo so far: Norway's men's curling team, decked out in their fantastic new outfits. 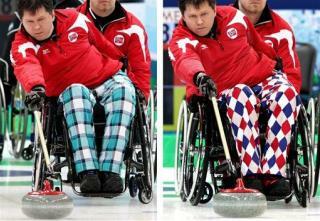 The team was a sensation at the Vancouver Olympics when members competed wearing boldly-colored, crazily-patterned golf pants instead of the standard black uniform curlers normally wear. This year, they have a bunch of new pants for Sochi, the AP reports: Think zig-zagging chevrons, a flowery pattern, and more. Don't laugh until you've seen what the Americans are wearing! I like it. This way you don't lose white people on the ice.